“Sheri is an extraordinary person, whom we met while she was taking care of her dying father, Gregory Corso. As a nurse, she already had certain skills at hand which most of us don’t in such a circumstance. But that was the least of what she had to offer. With tireless devotion and an exceptional spirit, she was able to give her father back some extra life, and then to make the end of it good. She took him home to Minnesota, where he was able to go gambling (and win 1200 bucks), watch ballgames, get to know his grandchildren, and die without pain or worry. Only a year or so before, Sheri had done the same for her mother. At the end of their lives, her parents slept in the same bed, although not together. They never spent more than a night in the same bed together in their lives. What occurred to us was how providential it was, that Sheri’s parents, as two inexperienced kids, came together only the one time it took to make her, thus ensuring themselves without knowing it at the time, a gentle end. Sheri said how lucky she feels to have gotten to do this for them, and that while she really only got to know her parents as an adult, she appreciated them all the more therefore. This issue is one of my favorites, and if I’m not mistaken, it was the last formal ‘interview’ Gregory gave, although he did do other recordings after ours, including a very beautiful collection of readings of his work done by Marianne Faithful, sitting at his bedside with him commenting or chuckling at the finish of each that she read. That is, I think, one of the most delightful recordings of poetry that I have ever heard and it’s worth finding, if you can. 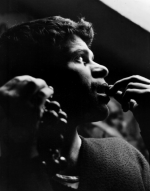 If you would like to order a copy of Gregory Corso’s Goodie, please use the paypal button on the Shop page of this site. Goodies are $3.00 plus $2.00 for postage in the US. If you are ordering from another country, please email me for postage.